We return to L.A for our next regular installment of Dday One’s ‘In Session’ series. This latest episode is dedicated to the memory of the late Keith ‘Guru’ Elam who sadly left us too soon last week. Mixed in with Gangstarr and Guru classics are new and older joints from The Q4, Dabrye, Asusu, The Prunes, Prince Paul and even a sneak preview of a Flying Lotus track from the new Cosmogramma LP. Not much else to say on this, it’s the usual hour of goodness from our man in L.A and requires your ears’ attention and complete immersion to enjoy it to the fullest. Don’t forget to check the latest from Dday and the Content Label on their website and if you haven’t yet check our news and downloads feed for a free EP from Marques Lafelt which we posted earlier today. This entry was posted on Friday, April 30th, 2010 at 11:40 am. 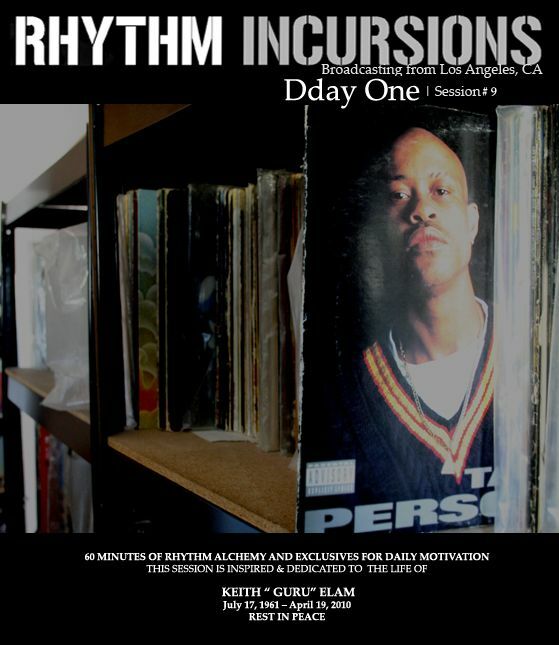 It is filed under Podcasts, DDay One - In Session series and tagged with Dday One, Flying Lotus, Dabrye, DJ Krush, Prince Paul, Robot Koch, Inner Science, Mumbles, The Q4, Bonobo, Guru, Gangstarr, 45 King, Asusu, Pharcyde, The Prunes, Mad Doctor X. You can follow any responses to this entry through the RSS 2.0 feed.